OK Google, what can Home do for me? 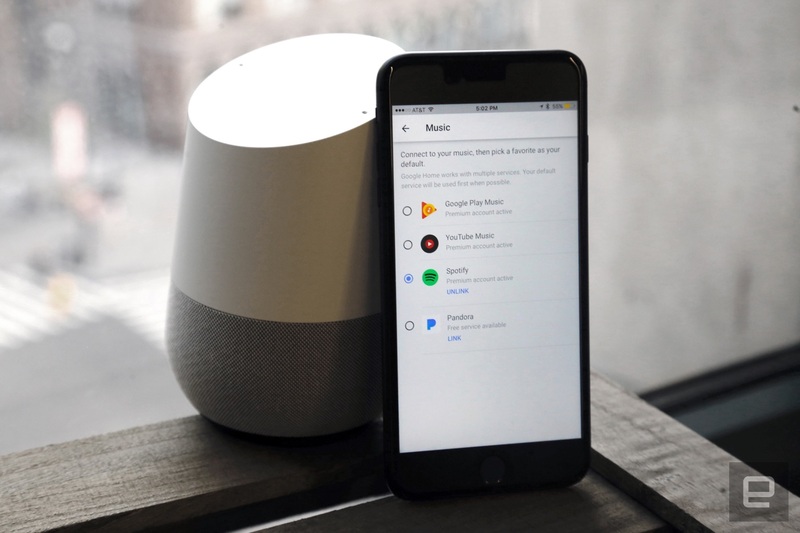 The Google Assistant was the big news from the company's I/O conference earlier this year, but it took months for Google's true Siri competitor to really arrive. First it was baked into the largely unnecessary Allo chat app, and then it showed up as a flagship feature on the new Pixel phones. Now Google Home is shipping, putting the Assistant a voice command away even when your phone is in your pocket. Its inspiration is obvious: The $129 Home directly takes on the Amazon Echo. Indeed, many of the features here are the same. But Google is betting that the vast amount of data it stores, combined with the vast amount of data it knows about its customers, can make for a more useful product. It's a reasonable notion, but Home isn't quite ready to deliver on the promise of "your own personal Google" just yet. Unlike with a phone you carry every day, or a laptop you type on and stare at for hours, you probably won't dwell much on the Home's design. Still, it's important that it be unobtrusive and inoffensive -- otherwise you're not going to want to put it out in the open, where it'll work best. Fortunately, Home is small and relatively pleasant to look at, and it offers a few customization options to help you match it to your living space. Much like Google's OnHub routers, Home is a contoured cylinder that reminds me of a wine bottle or flower vase. Its front is sloped, so you can see the array of LED lights that light up when you're talking to the device. You can also tap that front panel to pause music, or run your finger around it in a circular pattern to adjust the volume. Or you can hold your finger on it momentarily to make it listen to your voice if you don't feel like shouting the "OK Google" activation phrase. The upper two-thirds of the device are white, but the bottom contains a changeable "base." Again, it's similar to the OnHub, which has different "shells" you can swap out. The Home's default accent is a gray fabric, but I also had a chance to try out a "marine" blue fabric and a copper metal case. They're super-simple to pop out (and you get a peek at the internal speaker setup while you're at it). Of course, you'll need to shell out extra cash for another Home base. Those start at $20 a pop. Finally, there's a button that turns off the microphone; the power cord goes into the bottom and is routed through a little opening on the back. All told, Google made a piece of hardware that most people won't mind having out on a shelf or kitchen counter, and that's the most important thing here. OK Google: What can Google Home actually do? That's the most important question we need to answer in this review. 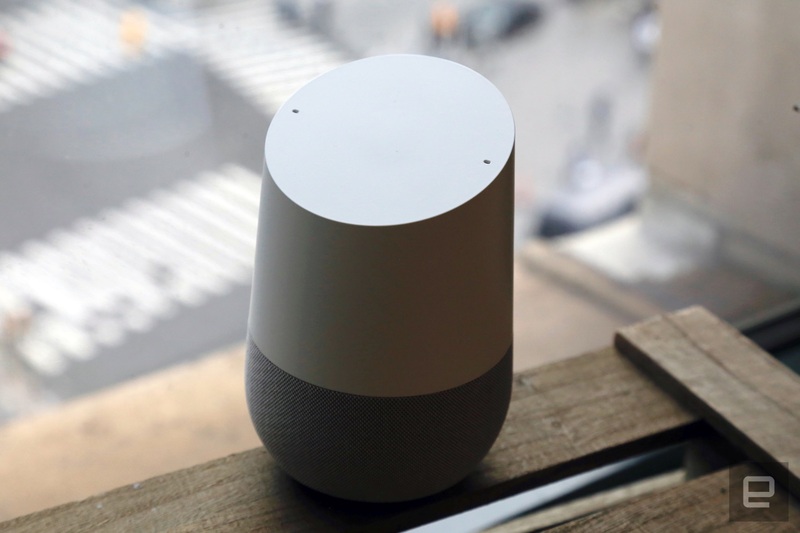 First you'll need to set up the device, but that's a painless process, accomplished with the new Google Home app for iOS or Android. (The app already let you set up and manage your Chromecast devices, but it has since been renamed and expanded to include Google Home.) The software detects that you have a new Home device, connects to it, hooks it up to your local WiFi network and asks you to sign in with your Google ID. Once that's done, you can start yammering away to your heart's content. Saying either "OK Google" or "Hey Google" makes the speaker start listening for your query. But what can it do? The most obvious way to get started is by asking it the same sorts of things you might normally ask Google. What's the weather outside? How about this weekend? You'll need to say the command phrase every time you want to ask a follow-up question, but Home remembers the context of your conversation, so you can ask "When was Abraham Lincoln born?" and follow up with "When did he die?" and get the right answer. The list of things you can ask the Google Assistant is limited only by your imagination, and that's one of Home's biggest strengths. Amazon's Alexa assistant has gotten smarter, but Amazon still doesn't have access to the same breadth of information as Google. Alexa doesn't understand context the way the Assistant does either. By comparison, Home and the Assistant are far more conversational. So you have access to just about everything Google knows -- which includes everything Google knows about you. Provided you opt in, of course. But once you have, you can ask Google when your next flight is, or how long it'll take you to get to work, or what the next appointment on your calendar is. You can ask Home to add things to a shopping list, and that list will then show up in the Google Keep app. There's a nifty feature where you can ask Home to tell you about your day and it'll give you commute info, your first appointment, the weather and any reminders you have set before jumping into a news broadcast. You can choose whether or not you want to hear this broadcast and then pick exactly where you want that news to come from. I have NPR and AP Radio news selected, but there are several dozen options, grouped into different categories. If, for instance, you'd rather hear sports and health news or a rundown of the latest in technology news (I should probably sign up for that one), you can. It's great that Home can access info in your Google account, but there are a few catches. 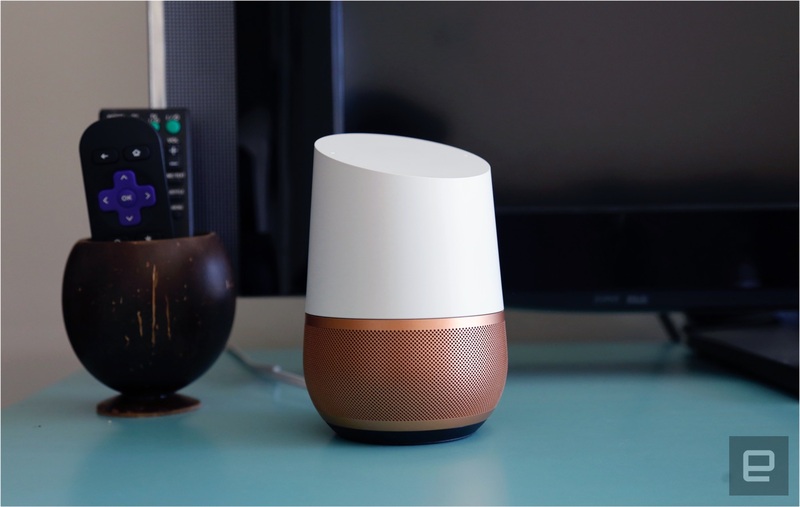 Even though anyone can shout "OK Google" and start talking to Home, the device can link with only one Google account at a time. So a spouse or roommate is out of luck in terms of getting any personalized information about their day. This presumably will extend to being able to send text messages from Home, a feature that Google has shown off but hasn't released yet. Also, some things that you'd expect to work right out of the box, like adding appointments to your calendar, surprisingly don't. Since you can use only one Google account at a time, you'll potentially need to choose between your home and work accounts. Most of my schedule is contained in my work account, but I use my home account for just about everything else. This means it's basically impossible to get Home to tell me my next appointment. Hopefully, in the future, Home will let you include multiple Google accounts -- either for a single person or so that multiple people in the house can make the most of the device. It's worth noting, though, that regardless of the use case, Google Home's voice recognition is excellent. Rarely did it misinterpret what I was asking (though it confused "play U2" with "play YouTube"), and ambient background noise didn't throw it off. Home reliably woke from sleep and responded to whatever I was saying. I'm not surprised, given how good Google's voice recognition is on the company's other products, but it's particularly important here. Just like on the Echo, Google Home's speaker is good for more than just talking -- it's also a handy way to play music and podcasts. For now, Home works with Spotify, YouTube Music, Pandora and Google Play Music. That isn't a ton of options, but given that Spotify is the market leader (and Apple Music isn't likely to work with Google Home any time soon), I can't really complain. You can even use Home with multiple services, but one will have to be set as the default. Once you're set up, Home recognizes a wide variety of music commands. You can ask it to play specific songs, artists or albums. With both Spotify and Google Play Music, I was able to name playlists in my library and have it play them back; GPM's stations work just as well. You can simply tell the device to "play some new music" and it'll select an appropriate playlist, tell you its name and start it up. Genres and even more vague descriptors work -- I asked Home to "play me some music good for focusing" and it started up the "Electronic Focus" station from GPM (my default service). Once playback has started, you can ask Home to tell you more info about the song -- but, sadly, you can't ask it to add songs to a playlist or give them a thumbs-up. That's one missing feature I hope Google can fix, because otherwise new songs I hear and enjoy are just going to float past me into the ether, never to be heard again. The only potential catch here is Home's speaker quality. It's loud enough to fill an average-sized living room with sound, but it's certainly not going to power a party. The speaker isn't stereo and lacks much of a low end, despite the two passive "radiators" meant to increase bass performance. It mainly seems suited to solo listening, or to have light background music on while entertaining. Initially, I was impressed with the sound quality for such a small device -- but that was before I compared it with my Sonos Play:1, which was superior in every way. However, for most people, Home is just as good as an average Bluetooth speaker, which means it's still useful. While Home may lack the sound quality I crave, it makes up for it with convenience. After a few days of asking Home to play me various albums and playlists, going back to managing my music with the clunky Sonos app felt like a chore. I was almost infuriated I couldn't ask the speaker to pause for a moment or turn its volume down. And the good news is that Home plays with Google's ecosystem of Chromecast devices, so if you have a pair of good speakers, you can just add the $35 Chromecast Audio and start telling Home to play music through that rather than its own internal speaker. I'm already dreaming of setting up a few pairs of nice speakers with Chromecast Audio and having a multi-room, voice-connected music system. 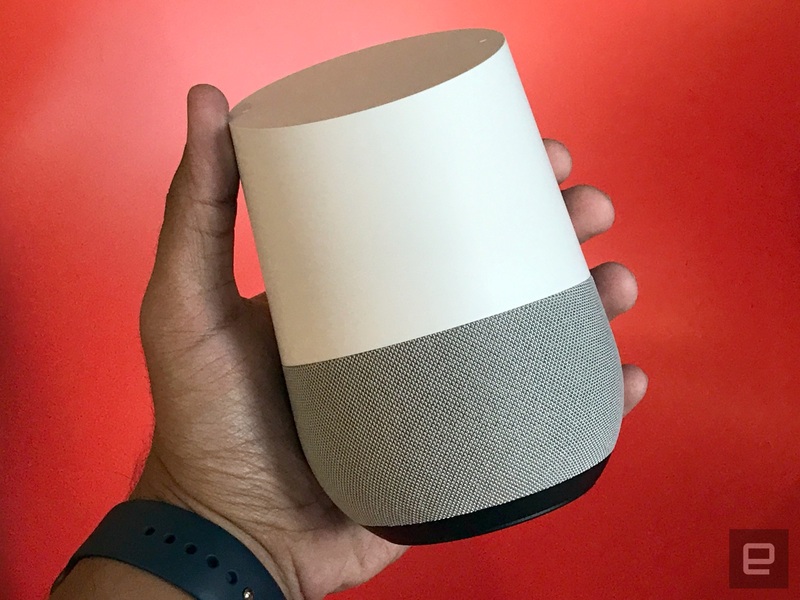 If you have audio apps on your phone or tablet that work with Google's Casting technology, you can use Home as a destination speaker and start playing audio there as well. And Home can control video Chromecast devices too, although support for that feature is rather limited as of launch. You can ask Home to start playing cute puppy videos, for example, and it'll open up YouTube and start a relevant video. But asking it to play TV shows from Netflix, Hulu or even Google Play videos doesn't work yet. Google says support for third-party Cast apps is coming at some point, but for now it's far more limited than I had hoped. The last piece of the puzzle is what Google Home can do beyond just accessing Google information. Out of the box, Home can control smart home devices from Nest, Philips Hue and SmartThings, and you can use IFTTT "recipes" to expand Home's capabilities as well. I unfortunately have a pretty dumb home, though, so I wasn't able to give this a shot. 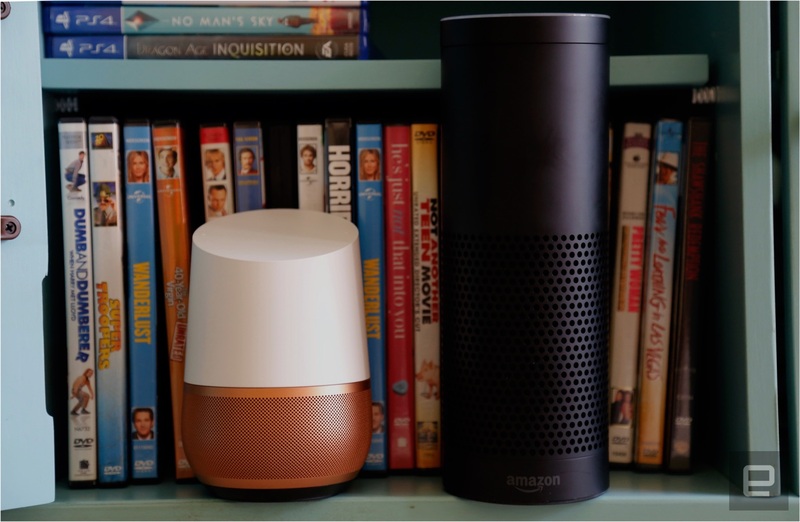 While Home works with some of the biggest smarthome options out there, it lags behind Echo. The Echo has a distinct advantage in that regard -- it's been on the market for much longer, which means Amazon has had more time to strike deals with more manufacturers. Echo works with WeMo, Samsung SmartThings, Wink, Insteon and Ecobee, in addition to Nest and Hue. If you're looking to have a centralized voice assistant to run your home, Amazon's option is the better choice right now. It's a similar story with third-party services (or "skills," as Amazon calls them). Over the past few years, the developer community has embraced the Echo to a surprising degree, and there are now tons of third-party commands that work on Amazon's speaker, with more coming every week. It's something Google can't match just yet. The company definitely has ambitions to open up the Assistant and let you do things like book restaurant reservations through OpenTable or buy movie tickets on Fandango, but those features aren't live yet. You can book a car through Uber once you link your account, but that's about it right now (outside of the aforementioned integration with streaming services like Spotify and TuneIn). If you've made it this far, it should be obvious who Google Home's main competition is. Amazon's Echo devices are time-tested and have a vast amount of third-party support at this point. Google Home undercuts the full-size Echo ($129 vs. $180), but the tiny and excellent Echo Dot only costs $50. It comes down to how invested you are in Google's ecosystem and how patient you can be. I have no doubt that Home will see expanded third-party support down the line, but right now the selection is limited. Still, Home knows way more about your world than the Echo, thanks to Google's massive knowledge graph. And on the other hand, if managing a smart home is more interesting to you, Amazon's Echo has the advantage. Google CEO Sundar Pichai wants to "build a personal Google for each and every user," and the Google Assistant (and therefore Home) are key to that mission. But it's not there yet. Yes, Google Home knows some basic info about me, but it doesn't know quite enough to make me feel like it's my own personal Google. Nor does it have the third-party services that'll really let me customize the device to fit my home and my needs. 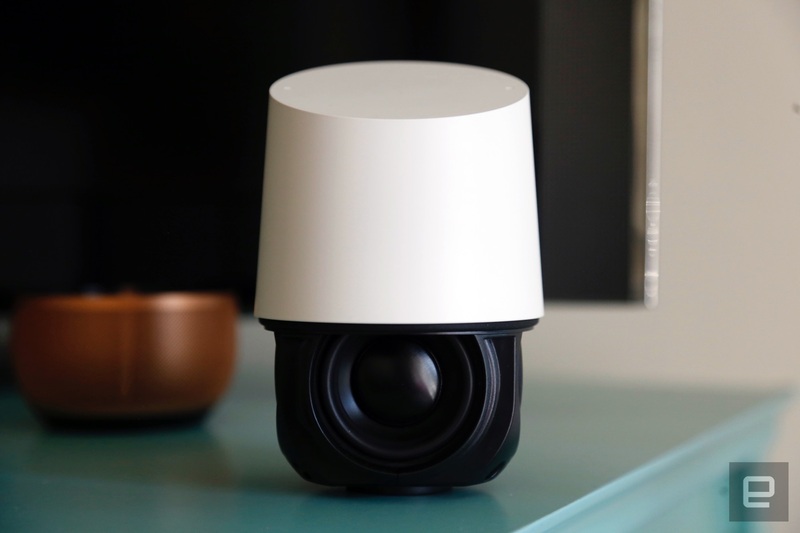 If I had some compatible smart-home products and a handful of Chromecast devices, Google Home would be much more appealing. Right now, however, it's little more than a toy. It's fun and occasionally very convenient to ask it questions and have it perform simple tasks, but it's hardly an essential part of my life. But Google Home is worth keeping an eye on -- it will almost certainly be more capable in three months (or even three weeks) than it is now. If you're someone who loves tapping into Google's mighty store of knowledge, don't sleep on Google Home. Just as the Echo got smarter and more valuable over time, I expect the same will happen here. And if you've already bought into Google's ecosystem, this might indeed be the home assistant for you.